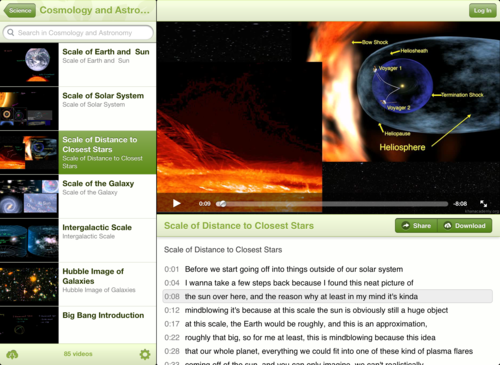 In mid-March, we launched the official Khan Academy iPad app. If you haven’t yet downloaded it, you can download the app for free from the App Store. Using the app, you can view all 3,200+ videos available on the Khan Academy website, including all of Sal’s videos as well as art history videos by Beth Harris and Steven Zucker, math videos by Vi Hart, and cryptography videos by Brit Cruise. For every video with English subtitles, the app includes an interactive transcript which allows you to read along with the video or go to a specific section if you want to rewind or jump ahead. If you log into your Khan Academy account, all of your progress is automatically saved so you can earn energy points and badges for the videos you watch. Best of all, using the app, you can download videos so you can watch them anywhere without internet access, such as in an airplane or on a long car ride – you can either download a single video or all the videos in a single topic. Currently, practice exercises are not available from within the iPad app but we hope to have them available in a future release; for now, you can do exercises directly on the website. If you haven’t yet tried it, download it for free. We hope the app is a great tool for both students and teachers – enjoy!